Join the discussion on our forums! Come discuss Dead Ringer over in our dedicated Dead Ringer discussion topic. Deathrattle: Draw a Deathrattle minion from your deck. Shortstop on N'zoth's softball team. good solid card for quest priest. Nothing to write home about, very similar to loot hoarder, perhaps a tad better whnen your're trying to complete the quest. This guy is useful both for Quest and for Inner Fire (in Wild: Deathlord, Tortollan Shellraiser). I can't wait to play my hybrid Priest: Quest for Inner Fire. Because he is a mech now, you know, just like Freeza and Tao pai pai? Seems almost like an auto include in nearly every priest deck if not for the fact that Sylvanas Windrunner is in wild. 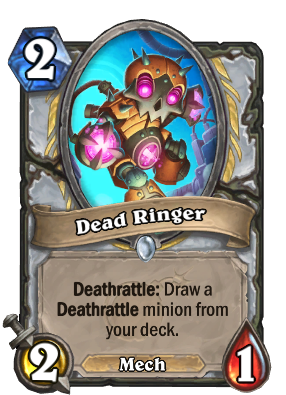 Im not sure what priest will be playing next expansion, but just by having some good deathrattles like applebaum, bone drake and maybe a new good one will do to make this card great. Quest priest got another card to it's arsenal! It would be cool if he has a father that is also a Deathratlle so there is a chance to pull him to your hand when it dies. Might be good if you're looking for specific deathrattle cards and to put more value in your deck. This card hurt my feelings. A loot hoarder who doesn't kill you in fatigue if you revive multiple copies and who dramatically increases the speed at which you can complete your quest. Pretty good if the quest is still a viable deck archetype but not bad if a deck requires one or two key deathrattles to function correctly. A better Loot Hoarder for Awaken the Makers. The only way it's better is because it's a mech, or if you're close to fatigue and you have no mechs in the deck, so you won't draw an extra card. Otherwise the downsides are substantial: if you happen to have no mechs early in the deck it will draw nothing, you may not always want to draw a mech, but rather something else, a spell for example, and it also gives your opponent some information about what you drew.